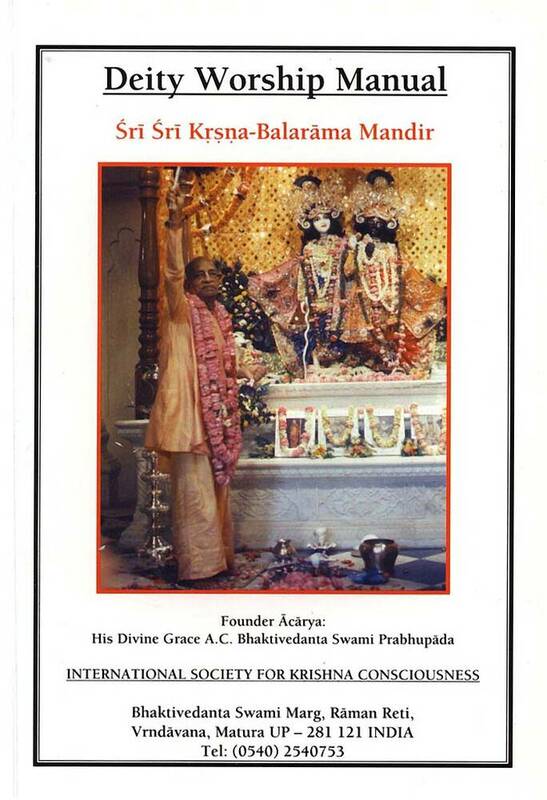 128 page paperback book that completely documents the current Deity Worship standards and procedures at the ISKCON Sri Krishna Balarama Mandir, Vrindavana, India. 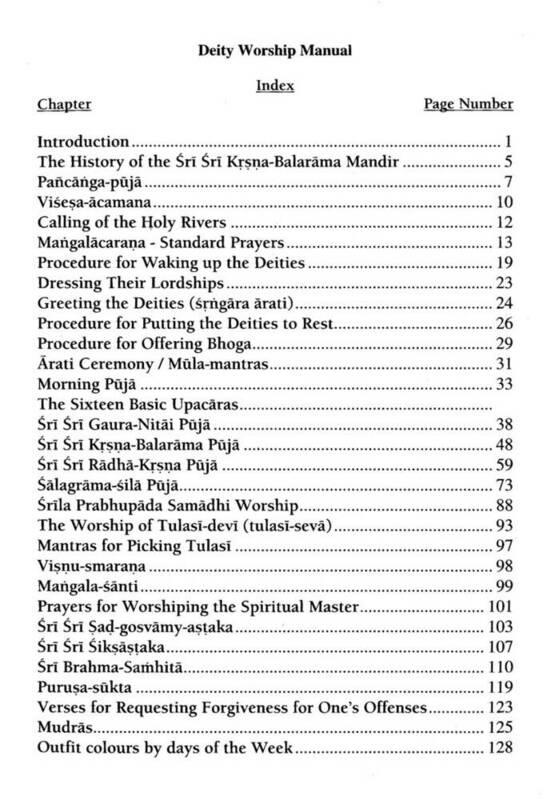 Apart from one very serious mistake [please read the full description] it documents all prayers and mantras and procedures in Deity Worship and will be useful for anyone who wants to perform Deity Worship on a large or small scale. "From now on unless I order you do something change or in addition, go on with the usual standard way. You manufacture ideas and then I have to waste my time. I have given you everything already, there is no need for you to add anything or change anything. Why you are asking these things? Who has given you such freedom?" 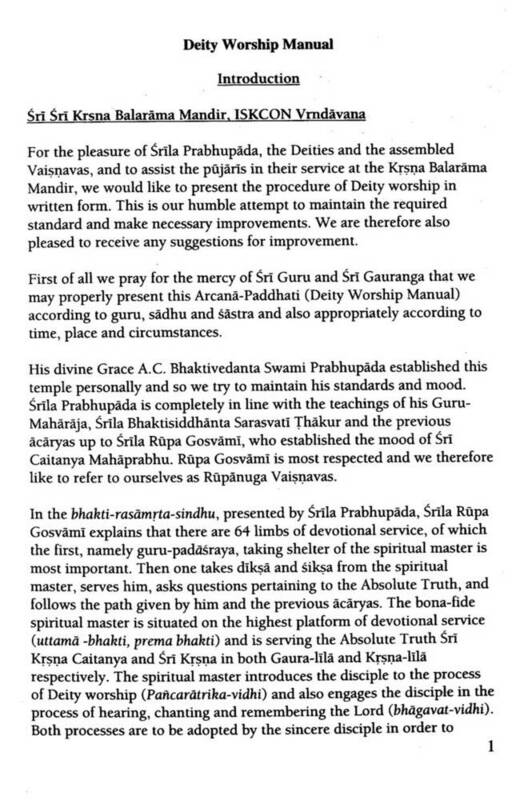 "The process is that whatever we offer to the Deity, that is offered to guru. And guru offers to his guru. In this way goes to Krsna. We don't directly offer Radha-Krsna. No. We have no right. Neither He accepts in that way. The pictures of the acaryas, why there are? Actually, one has to offer the plate to his guru, and he'll offer his guru, he offers his guru, his guru. In this way it will go to Krsna. That is the process. You cannot directly approach Krsna or other subordinates to Krsna. That is not possible." "Note: It should be understood that by the mercy of the spiritual master, Srila Prabhupada, we are able to engage in the service of the Lord in His arch-vigraha, like offering bhoga and therefore we ask his permission first in order to be able to serve. Then at the end, after the offering, we meditate that Srila Prabhupada and your spiritual master, where appropriate, are taking the remnants both in Krishna-lila and Gaura-lila after all the associates have taken." "The greatest danger to our movement will come when we manufacture and create our own process for worshiping the deities. So don't ask any more new questions, whatever is going on, follow it just to the exact standard as I have given you, that's all."